ILORIN—The son of a former Police image maker in Kwara State was among six suspected cultists paraded by Kwara State Police Command, yesterday. The state Police Commissioner, Aminu Pai Saleh, who disclosed this while parading the suspects, said the son of the former PPRO of Kwara State Police Command, Lanre Mohammed Soliu, was arrested for alleged murder and membership of Aiye Confraternity cult group. The suspect, aka Askari of 13, Ile Nda compound, Emir’s Palace Ilorin, was arrested on Tuesday after a manhunt for him over alleged killing of Yemi Bayero of Ago market, Ilorin. The suspect confessed to the the killing with other accomplicies, Abolaji Safti Ojulari, Adeyi and Tiro. The commissioner, who also paraded an alleged notorious cultist, Abolaji Safti Ojulari, of Kankatu area of Ilorin metropolis, said the suspect was arrested on May 5, 2018 after a manhunt. “He has been on the command’s wanted list for over two years. He lives at Kankatu area of Ilorin where he was hiding. He confessed to being an active member of Aiye confraternity. He also named his 13 accomplices,” he said. The police boss also paraded one Azeez Mayaki, male 26, who was arrested on Tuesday, saying the suspect had confessed to killing of one Lateef on February 2, 2018 at Ode Alfa Nda, Ilorin. “Also, one Suleiman Babatunde, male 26 of Gambari area of Ilorin, was arrested after a discreet investigation linked him to killing of one Owolabi, male, at Amilegbe area of Ilorin in July 2017 with an accomplice, Olaitan. 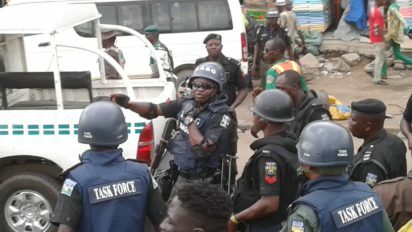 The police commissioner, who said all the arrested suspects would soon be charged to court, advised criminal elements in the state to eschew criminal acts, adding that the command was prepared to run them out of circulation. The post Police parade son of ex-Kwara PPRO, 5 others over alleged cultism appeared first on Vanguard News. Is political accuracy deteriorating universities’ objective?